So I just bought myself a set of these and am looking at options to build!! I see Madisound offers pre cut cabinets and that may just be exactly what I do with them but thought I would ask some of the experts here if I should consider any other enclosures for them?? Any thoughts are most welcome! I believe that's what the Cain & Cain used for most of their designs (the 208EZ Sigma), so there should be a lot of designs out there. Oh yeah, lots of designs out there!! What I am trying to do here is get some first hand knowledge from folks that have tinkered with or explored different builds with these speakers who might be willing to impart some of their wisdom on me!! No experience with the Fostex drivers. Drawing parallels here but the back loaded horns seem to work well with this style driver. As does the JE Labs style OB. Some of the Fostex drivers are kind of piercing from my experience (and, of course, my perspective). One of the Massachusetts gurus had a pair of Cain & Cain Abbys in his kitchen, powered by a Mac MC-225 (not a shouty amplifier) and I pretty much couldn't stand listening to them playing "pop" music (i.e., multi-track mono mixed to pseudo-stereo, with lots of compression, EQ and other studio trickery). Getting good balance out of many of the Fostex offerings takes some perseverance, methinks. Yup have heard some downright ear bleeding Fostex before, I built them ( a Steve Deckert design), horrible really!!!!! 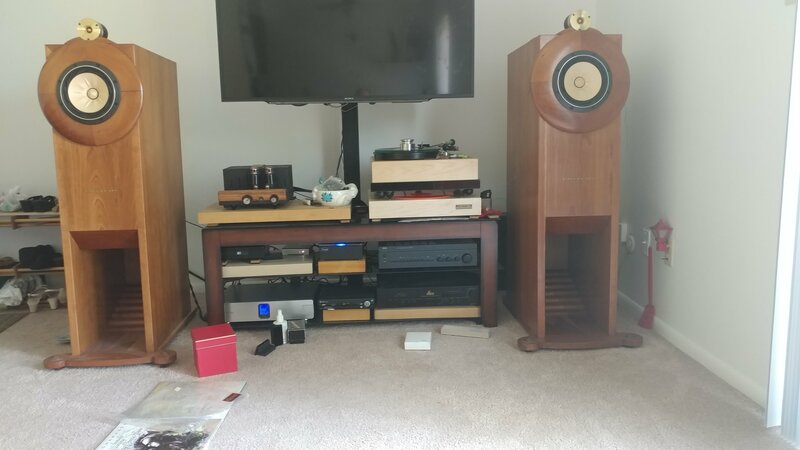 Friend of mine has a couple of single driver speakers, one back loaded and the other a variation of... Both of them are outfitted with Lowther driver's, ( he loves them, me not so much) him and I were yakkin a few weeks back and he was the one that told me about these drivers as he had taken his Lowthers out of his back loaded and put these Fostex in and ( tinkered with a wee bit of stuffing I think) and as of yet has not found the need or desire to put the Lowthers back in...…. now for him to say this to me , spoke volumes of what he thought of these Fostex! He has tried other Fostex and had pretty much the same result as me when hearing them ( grimacing face and a desire to turn the volume down), here's hoping!!!! Oh and for the record, not a huge fan of Mac gear, all kinda hurts my ears!!!!! h and for the record, not a huge fan of Mac gear, all kinda hurts my ears!!!!! Certainly my experience with my unfortunate (and short-lived) pairing of an MC2100 and Klipsch Cornwalls. The MC-225, though, IMO, is a good sounding amplifier. A very good sounding amplifier, in fact. One Mac I would not at all mind owning. I changed dustcaps on a set of Fostex from aluminum to paper to tame that shrill quality. They were "tizzy" too! The paper took care of all of that. Allow for break in to happen. fostex often have a long break in. i've had good luck with a variety of fostex drivers. diyaudio is the place for tons of DIY speaker designs. Had no issues getting my Lowthers to sing sweetly. I'm sure the Fostex can also do so. Just takes research and patience. Sooooo, after much research and such I have finally decided to build the fostex recommended enclosures for these, looks pretty easy!! Keeping my eye out for the T90A or T900A tweeter to go along with them, should be fun!!! Thanks for all the guidance folks!! Please post pics of the journey. Will do!! Been a while since I’ve built anything.... looking forward to this!!! Besides, if all goes well my daughter has hinted she would love to have my present system in her new place.... this way I can gift it to her and buy or build a new system!! Pretty. Bet they sound good. Beautiful!!!! Just got a hit in Quebec for the tweeter ( Fostex T900a). Waiting to hear what he wants for them... prolly to rich for my blood but ya never know!!!! Well, they're certainly pricey brand new. These might be a fun and cheaper alternative super tweeter option.